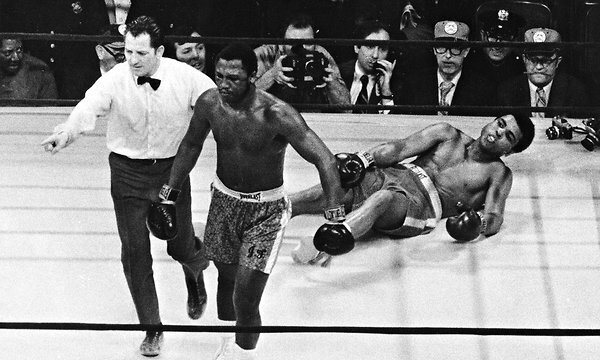 Joe Frazier won the undisputed heavyweight title with a 15-round decision over Muhammad Ali at Madison Square Garden in March 1971, in an extravaganza known as the Fight of the Century. It was an overpowering modus operandi that led to versions of the heavyweight crown from 1968 to 1973. Frazier won 32 fights in all, 27 by knockouts, losing four times — twice to Ali in furious bouts and twice to George Foreman. He also recorded one draw. A slugger who weathered repeated blows to the head while he delivered punishment, Frazier proved a formidable figure. But his career was defined by his rivalry with Ali, who ridiculed him as a black man in the guise of a Great White Hope. Frazier detested him. Frazier won the undisputed heavyweight title with a 15-round decision over Ali at Madison Square Garden in March 1971, in an extravaganza known as the Fight of the Century. Ali scored a 12-round decision over Frazier at the Garden in a nontitle bout in January 1974. Then came the Thrilla in Manila championship bout, in October 1975, regarded as one of the greatest fights in boxing history. It ended when a battered Frazier, one eye swollen shut, did not come out to face Ali for the 15th round. The Ali-Frazier battles played out at a time when the heavyweight boxing champion was far more celebrated than he is today, a figure who could stand alone in the spotlight a decade before an alphabet soup of boxing sanctioning bodies arose, making it difficult for the average fan to figure out just who held what title. The rivalry was also given a political and social cast. Many viewed the Ali-Frazier matches as a snapshot of the struggles of the 1960s. Ali, an adherent of the Nation of Islam who had changed his name from Cassius Clay, came to represent rising black anger in America and opposition to the Vietnam War. Frazier voiced no political views, but he was nonetheless depicted, to his consternation, as the favorite of the establishment. Ali called him ignorant, likened him to a gorilla and said his black supporters were Uncle Toms. “Frazier had become the white man’s fighter, Mr. Charley was rooting for Frazier, and that meant blacks were boycotting him in their heart,” Norman Mailer wrote in Life magazine after the first Ali-Frazier bout. Frazier could never match Ali’s charisma or his gift for the provocative quote. He was essentially a man devoted to a brutal craft, willing to give countless hours to his spartan training-camp routine and unsparing of his body inside the ring. Billy Joe Frazier was born on Jan. 12, 1944, in Laurel Bay, S.C., the youngest of 12 children. His father, Rubin, and his mother, Dolly, worked in the fields, and the youngster known as Billy Boy dropped out of school at 13. He dreamed of becoming a boxing champion, throwing his first punches at burlap sacks he stuffed with moss and leaves, pretending to be Joe Louis or Ezzard Charles or Archie Moore. At 15, Frazier went to New York to live with a brother. A year later he moved to Philadelphia, taking a job in a slaughterhouse. At times he battered sides of beef, using them as a punching bag to work out, the kind of scene used by Slyvester Stallone in the film “Rocky,” though Stallone said that he drew on the life of the heavyweight contender Chuck Wepner in developing the Rocky character. Durham discovered Frazier boxing to lose weight at a Police Athletic League gym in Philadelphia. Under Durham’s guidance, Frazier captured a Golden Gloves championship and won the heavyweight gold medal at the 1964 Tokyo Olympics. He turned pro in August 1965, with financial backing from businessmen calling themselves the Cloverlay Group (from cloverleaf, for good luck, and overlay, a betting term signifying good odds). He won his first 11 bouts by knockouts. By winter 1968, his record was 21-0. A year before Frazier’s pro debut, Cassius Clay won the heavyweight championship in a huge upset of Sonny Liston. Soon afterward, affirming his rumored membership in the Nation of Islam, he became Muhammad Ali. In April 1967, having proclaimed, “I ain’t got nothing against them Vietcong,” Ali refused to be drafted, claiming conscientious objector status. Boxing commissions stripped him of his title, and he was convicted of evading the draft. An eight-man elimination tournament was held to determine a World Boxing Association champion to replace Ali. Frazier refused to participate when his financial backers objected to the contract terms for the tournament, and Jimmy Ellis took the crown. But in March 1968, Frazier won the version of the heavyweight title recognized by New York and a few other states, defeating Buster Mathis with an 11th-round technical knockout. He took the W.B.A. title in February 1970, stopping Ellis, who did not come out for the fifth round. In the summer of 1970, Ali won a court battle to regain his boxing license, then knocked out the contenders Jerry Quarry and Oscar Bonavena. The stage was set for an Ali-Frazier showdown, a matchup of unbeaten fighters, on March 8, 1971, at Madison Square Garden. Each man was guaranteed $2.5 million, the biggest boxing payday ever. Frank Sinatra was at ringside taking photos for Life magazine. The former heavyweight champion Joe Louis received a huge ovation. Hubert H. Humphrey, back in the Senate after serving as vice president, sat two rows in front of the Irish political activist Bernadette Devlin, who shouted, “Ali, Ali,” her left fist held high. An estimated 300 million watched on television worldwide, and the gate of $1.35 million set a record for an indoor bout. Frazier, at 5 feet 11 1/2 inches and 205 pounds, gave up three inches in height and nearly seven inches in reach to Ali, but he was a 6-to-5 betting favorite. Just before the fighters received their instructions from the referee, Ali, displaying his arrogance of old, twice touched Frazier’s shoulders as he whirled around the ring. Frazier just glared at him. Frazier wore Ali down with blows to the body while moving underneath Ali’s jabs. In the 15th round, Frazier unleashed his famed left hook, catching Ali on the jaw and flooring him for a count of 4, only the third time Ali had been knocked down. Ali held on, but Frazier won a unanimous decision. For Frazier, 1971 was truly triumphant. He bought a 368-acre estate called Brewton Plantation near his boyhood home and became the first black man since Reconstruction to address the South Carolina Legislature. Ali gained vindication in June 1971 when the United States Supreme Court overturned his conviction for draft evasion. Frazier defended his title against two journeymen, Terry Daniels and Ron Stander, but Foreman took his championship away on Jan. 22, 1973, knocking him down six times in their bout in Kingston, Jamaica, before the referee stopped the fight in the second round. Frazier met Ali again in a nontitle bout at the Garden on Jan. 28, 1974. Frazier kept boring in and complained that Ali was holding in the clinches, but Ali scored with flurries of punches and won a unanimous 12-round decision. Ali won back the heavyweight title in October 1974, knocking out Foreman in Kinshasa, Zaire — the celebrated Rumble in the Jungle. Frazier went on to knock out Quarry and Ellis, setting up his third match, and second title fight, with Ali: the Thrilla in Manila, on Oct. 1, 1975. In what became the most brutal Ali-Frazier battle, the fight was held at the Philippine Coliseum at Quezon City, outside the country’s capital, Manila. The conditions were sweltering, with hot lights overpowering the air-conditioning. Ali, almost a 2-to-1 betting favorite in the United States, won the early rounds, largely remaining flat-footed in place of his familiar dancing style. Before Round 3 he blew kisses to President Ferdinand Marcos and his wife, Imelda, in the crowd of about 25,000. But in the fourth round, Ali’s pace slowed while Frazier began to gain momentum. Chants of “Frazier, Frazier” filled the arena by the fifth round, and the crowd seemed to favor him as the fight moved along, a contrast to Ali’s usually enjoying the fans’ plaudits. Frazier took command in the middle rounds. Then Ali came back on weary legs, unleashing a flurry of punches to Frazier’s face in the 12th round. He knocked out Frazier’s mouthpiece in the 13th round, then sent him stumbling backward with a straight right hand. Ali jolted Frazier with left-right combinations late in the 14th round. Frazier had already lost most of the vision in his left eye from a cataract, and his right eye was puffed and shut from Ali’s blows. Eddie Futch, a renowned trainer working Frazier’s corner, asked the referee to end the bout. When it was stopped, Ali was ahead on the scorecards of the referee and two judges. “It’s the closest I’ve come to death,” Ali said. Frazier returned to the ring nine months later, in June 1976, to face Foreman at Nassau Coliseum on Long Island. Foreman stopped him on a technical knockout in the fifth round. Frazier then announced his retirement. He was 32. He later managed his eldest son, Marvis, a heavyweight. In December 1981 he returned to the ring to fight a journeyman named Jumbo Cummings, fought to a draw, then retired for good, tending to investments from his home in Philadelphia. Both Frazier and Ali had daughters who took up boxing, and in June 2001 it was Ali-Frazier IV when Frazier’s daughter Jacqui Frazier-Lyde fought Ali’s daughter Laila Ali at a casino in Vernon, N.Y. Like their fathers in their first fight, both were unbeaten. Laila Ali won on a decision. Joe Frazier was in the crowd of 6,500, but Muhammad Ali, impaired by Parkinson’s syndrome, was not. In addition to his son Marvis and his daughter Jacqui, Frazier is survived by his sons Hector, Joseph Rubin, Joseph Jordan, Brandon Marcus and Derek Dennis; his daughters Weatta, Jo-Netta, Renae and Natasha, and a sister. His marriage to his wife, Florence, ended in divorce. Fascination with the Ali-Frazier saga has endured. Frazier’s true feelings toward Ali in his final years seemed murky. The 2009 British documentary “Thrilla in Manila,” shown in the United States on HBO, depicted Frazier watching a film of the fight from his apartment above the gym he ran in Philadelphia. In March 2011, however, on the eve of the 40th anniversary of the first Ali-Frazier fight, Frazier said he was willing to put the enmity behind him.